BLOWOUT SALE! 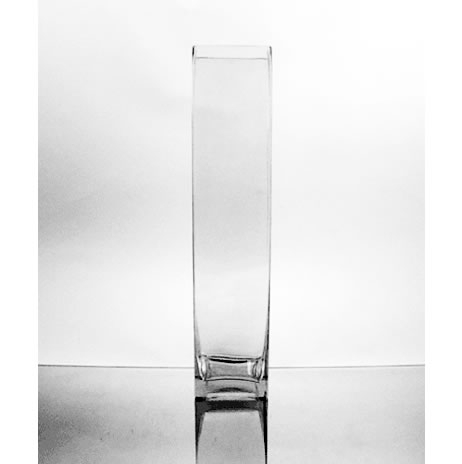 Glass rectangular block vase, 18" tall, 4" x 4" top opening. These are nice quality glass, perfect for Manzanita Branches centerpieces or other materials. Glass vases may require additional shipping. Shipping discount promotions do not apply to glass vases. Glass Rectangular Vase, 8" x 3" Glass Cylinder Vase, 8" x 5" Geometric Glass Terrarium, Hanging Teardrop Glass Rectangular Vase, 16" x 6"
Glass Cylinder Vase, 6" x 5" Cylinder Vase Centerpiece Kit, 6 Pieces Glass Rectangular Vase, 6" x 3" Glass Cylinder Vase, 10" x 8"
Much thicker glass than those at Michael's or Hobby Lobby. AND CHEAPER TOO !!! Love the elegant height of the 18in. and the diameter of 4 inches, allows me to be creative. I've been playing with Christmas balls, metallic shred, fabric, lights, anything to put on the inside to go with an arrangement. These vases are beautiful. They arrived promptly and in excellent condition. Thank you. I wasn't able to find enough this size at local stores, so your site was a God send.